DURHAM, New Hampshire — It was a frustrating night for the No. 9 Boston University men’s hockey team. A fruitless first period against the University of New Hampshire at the Whittemore Center on Friday bled into a pretty productive second period for the Terriers (17-9-5, 10-5-4 Hockey East), who went up two goals to none on a pair of tallies from senior assistant captain Danny O’Regan within the first six minutes and 41 seconds of the middle frame. 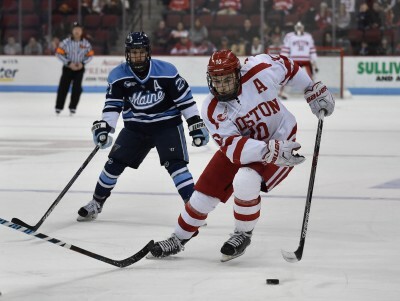 But although it held a 2-0 lead at the time, the advantage would not last for BU, which wound up in a 3-3 draw with the Wildcats (10-15-6, 4-9-6 Hockey East) by night’s end. The Terriers dominated UNH in shots through the first period by a 12-3 margin and outattempted their conference foe 22-6 through 20 minutes but were unable to score. That discrepancy in shots and attempts continued for much of the game, ultimately ending in a 70-30 split in favor of BU. In fact, the only period in which the teams were on even ground for shots was the second when both sides tested their opposing goaltenders nine times. They ended up being even on the scoreboard in that stanza, too, as winger Jamie Hill and centerman Michael McNicholas wiped the Terrier lead in a span of two-and-a-half minutes and by the time the clock flashed 10:00 to signal the game was halfway over. BU took a hit with 18:22 gone in the second as forward Shane Eiserman boarded sophomore defenseman Brandon Hickey. The blue liner was down on the ice for a while and did not put any pressure on his right leg when O’Regan and senior captain Matt Grzelcyk eventually helped him off. Neither team found the back of the net for what would be a cumulative 27:28, and the first to do so after was BU as O’Regan finished off his second career hat trick with a goal in tight that took advantage of a horizontal Danny Tirone in the crease, flipping the puck over the netminder to regain the lead for the Terriers with 2:32 to go. That lead was short-lived, however, lasting just 35 seconds. While working the puck in the offensive zone, BU turned it over and it came back the other way. The Wildcats managed a shot from the point and forward Maxim Gaudreault jumped on the rebound to knot things up at 3-3. From there and through overtime, it was the Tirone show as he finished the night with 37 saves and turned aside all of the Terriers’ four tries through the five extra minutes. In preparing for Saturday’s game against the Wildcats at home, O’Regan said it just comes down to one improvement in particular.